Here is an excerpt of an article from the June 1878 issue of the Clare County (Michigan) Press concerning Winfield Scott Gerrish and his logging railroad that was mentioned in a previous post. 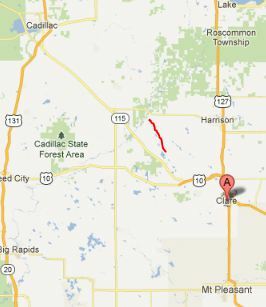 Note: Red line indicates approximately location of railroad. “But the object of my present raid into Clare County…to visit Gerrish’s lumber camp, near Lake George, said to be the headquarters of the most extensive lumber operations conducted by any single individual in the known world. The principle camp is about 15 miles northwest of Farwell, and to make that distance at this season of the year over a road, which scatters all over the country and has no bottom to speak of, requires both physical and mental ability of no mean order. Luckily our little party…secured a span of ponies, somewhat larger than rat terriers, and a light single-seated buggy, which afforded ample room for one to ride comfortably in the middle and one to walk comfortably on each side. Both buggy and ponies, however, deceived their looks and passed over, around, and through mud holes safely, which might have swallowed a heavier outfit from sight, and we reached our destination in safety, without getting more than a mile or two out of the way at any one time. One would suppose there should be no difficulty in following a road through the woods over which a locomotive has passed in search of a railroad, as there did over this January last, but when he reflects that the winding path has branches for every hill and camp, and that a man might travel for hours–or possibly all day–on the wrong road without meeting any one to set him right, the probability of a stranger finding any given camp the same day he strikes out for it will be seen to be very small. We were especially fortunate in reaching the headquarters camp in time for a good square dinner, which was served up in a manner that would do credit to many a hotel. The camp was started in 1870, and with its cluster of log shanties, blacksmith shop, railroad buildings, etc., it looks very much like a busy and permanent village, The little lumber railroad which passes through it and is the pioneer railroad of that kind, is now about 13 miles long and strikes the Muskegon River about 18 miles above Evart and about 40 miles below Houghton Lake. It was begun in September 1870; the first locomotive arrived November of that year, the second in November 1877, and the third in January 1878, The first two were “poled” up the Muskegon on rafts from Evart, and the last was run through the woods from Farwell, feats in engineering, which the old-fashioned lumberman ridiculed as impossible. The main road has four switches, two train dispatchers, and a telephone running its whole length, by which the engineers receive their orders at each switch, and the trains are run with the regularity of clockwork. Each locomotive draws thirteen cars, and is kept running night and day, the three trains putting into the river 24 loads every 24 hours, or about 400,000 feet a day. Three men run each train, three remain on the river bank to unload, and 16 to 18 remain at the skidways to load, Each crew is on duty 12 hours, when it is relieved by a second crew for twelve hours, and so they alternate the season through, no train being delayed for meals or any other purpose. Over 50,000,000 feet have been put into the river over tills road this season, and from present appearances the cars will be kept running all summer. This road has several branches which are run off to one side or the other, as the convenience of skidding and loading logs requires, while the main branch is being steadily extended. By fall, it will probably have reached the old State road, about six miles north of Farwell, when the depot of supplies will be moved to that point, and the plank road, which already runs nearly half way out from the village, will be extended to the proposed depot. This will lessen the cost of supplying the camps, which is now very great, to about one-third or one quarter what it has been. How much farther the road will be extended remains to be seen. Mr. Gerrish already owns some 11 or 12 sections in the township, and is steadily adding to their number. There is doubtless standing pine enough within range of the road to keep it running a dozen years yet. * There are a work in the camps about 400 men and 70 teams. During the winter there were nearly 700 men and about 225 teams. The sales of logs and lumber from the logs put in the past winter and spring, and those now on the skids, to be put in this summer, have aggregated $105,000. This is exclusive of Mr. Gerrish’s operations at Houghton Lake, where, in company with John L. Woods, of Cleveland, he has put in some 14,000,000 feet this season, and will put in 5,000,000 or 6,000,000 feet more. He also has other camps and investments in the lumber business, including a large steam sawmill at Muskegon, but the figures above given are enough to vindicate his title of being the largest operator in the business. * The writer of the article, as well as Gerrish and others, vastly underestimated the time it would take to cut the pines and other valuable timber. Basically, the county was bare within a decade and the county was soon to go into an economic decline.